In a large crockpot (6 quart crockpot), add in the enchilada sauce, undrained tomatoes, undrained chili beans, drained and rinsed black beans, drained corn, and uncooked chicken breasts. Cut each chicken breast into 2-3 pieces after removing the fat only if I'm cooking this on high (cooks faster/more evenly in my crockpot). Serve with sour cream, cheddar cheese, avocado, and fresh cilantro as desired. Place oil in a large pot and place over medium high heat. Add in onion, garlic and red pepper and saute for 5-7 minutes, stirring frequently. Next add in ground turkey and break up the meat; cooking until no longer pink. Next add in chili powder, cumin, oregano, cayenne pepper and salt; stir for about 20 seconds. Next add in tomatoes, chicken broth, kidney beans and corn. Bring to a boil, then reduce heat and simmer for 30-45 minutes or until chili thickens and flavors come together. Taste and adjust seasonings and salt as necessary. Garnish with anything you'd like. To make this recipe in the slow cooker: Reduce the chicken broth to 1/2 cup and brown the turkey and onions before adding to the slow cooker. This is an awesome tailgating or football party recipe! Spoon about 1 cup of chili into each of four 9 ounce ramekins (fill to around 1 inch from the top of the ramekin) and set aside. In a medium bowl, mix together all of the dry cornbread crust ingredients. In a small bowl, stir together the buttermilk, vegetable oil and egg. Mix the wet ingredients into the dried ingredients. Spread about a ½ cup of the cornbread mixture over the chili in each ramekin. 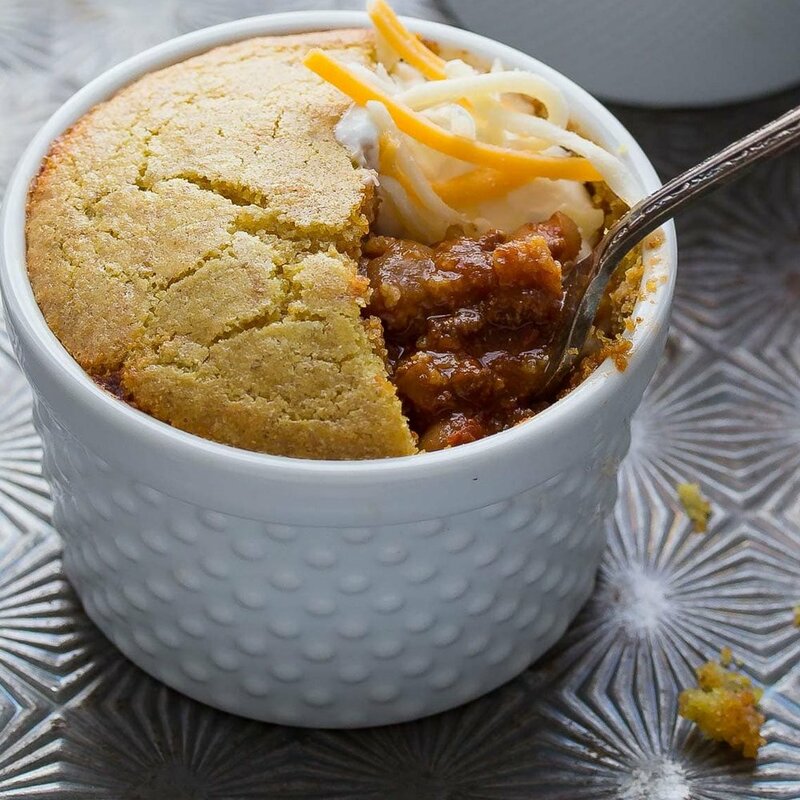 Place the ramekins on a baking sheet and bake for 20-25 minutes, until cornbread is cooked all the way through. First chop your veggies and measure out the ingredients. Add veggie broth and crushed tomatoes followed by lentils, quinoa, chili beans (pinto beans in chili sauce), black beans, onion, garlic, peppers, corn, and dried spices. Keep the ingredients layered and don't stir for best results. Set Instant Pot (I use a 6 QT) HIGH pressure for 5 minutes and allow to come to pressure. Quick release (aka manually release) the pressure and wait for the pin to drop and the pot to depressurize before opening. Lastly, feel free to adjust seasoning (spices and salt) to taste, adding more of what you prefer to get your ideal flavor punch. Add all your favorite toppings and enjoy! This chili is great the day of, and even better as leftovers too. Chili is magic like that and great for meal prep for the week! You can even freeze some for later. See more notes at Peas and Crayons.